In this episode of The Play Therapy Parenting Podcast, Dr. Brenna Hicks talks about the play therapy skill, reflecting feelings, and why it’s okay for parents to simply reflect a child’s feeling back to them, and then stop! We tend to want to solve problems for our kids, or try to make our kids feel better, when sometimes, simply “sitting” in the child’s emotion is what they need more. Hi everyone. I’m Dr Brenna Hicks, founder of Play Therapy Parenting(TM), and The Kid Counselor (TM). It’s good to be with you. I help parents gain confidence in their parenting skills so that they can create the family life they desire. I wanted to share something with you. 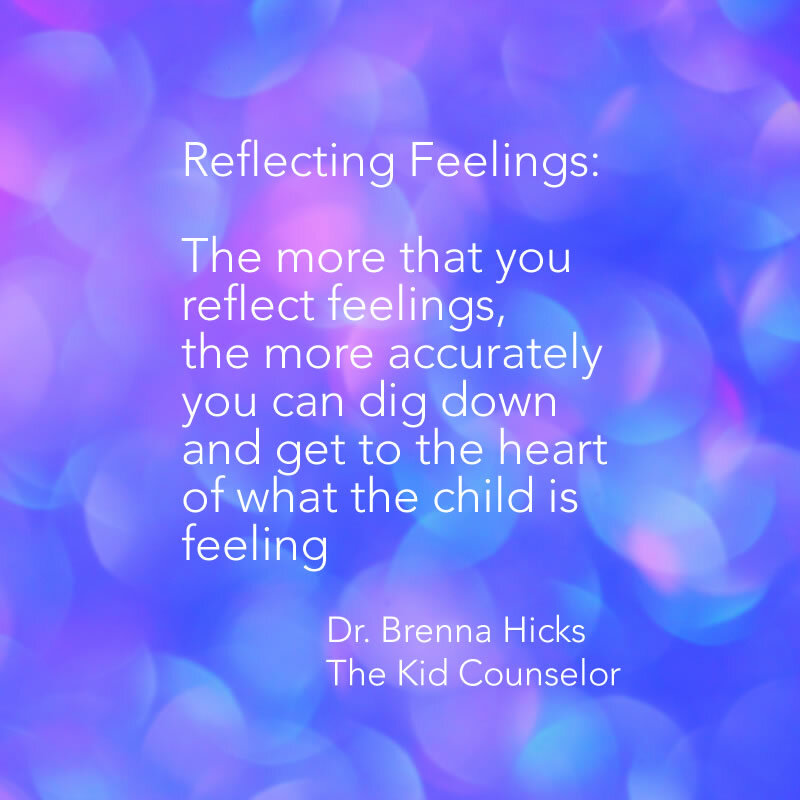 I have been training some parents in the parent training that I offer and one of the foundational skills that I teach is reflecting feelings. So for those of you who may not be familiar with what that is, is essentially paying attention to your child, taking their cues, figuring out what the emotion they are expressing either verbally or non verbally, and then telling them what you see them expressing so that might look like “you are happy” or “you’re frustrated”. “You’re angry that the toy broke”, and so if you notice the pattern there, for those of you that may not be familiar with this skill, you start with “you”, then you’ve determine the emotion, and then you add a qualifier. If you think that that’s helpful. So essentially your feeling reflections always begin with the word “you” they include the emotion in the middle, and a description of why the child is feeling that way at the end. And one of the key components of this principle that I’m training parents to use is that… that’s enough. Let me explain why it’s really difficult for us as adults, especially as parents who care about their kids to let the child sit in a negative emotion without trying to solve the problem for them, fix it, help them to feel something differently, or even trying to distract them with a completely different topic. It’s really difficult to acknowledge the feeling and let that be enough and just sit in that moment. Let me give you an example. If your kid came home from school and said, “I have no friends, no one likes me”. I think instinctively as a parent, we can identify that he’s feeling lonely, he’s feeling sad, feeling rejected. He’s feeling isolated, maybe feeling down depressed for an older kid, and so do you know the list goes on and I’ll probably save that for a different video, but it’s interesting how the more that you reflect feelings, the more accurately you can dig down and actually get to the heart of what the child’s actually feeling. Because I think if we think in terms of broad feeling categories, we tend to get stuck in the happy, sad, mad, scared categories. Those four are probably the most prominent emotional categories that we think of and so we kind of tend to sit in those words. So I think many of us would probably, without knowing the skill, not using it very often would say “you’re sad” if we were trying to identify what the child was feeling, but I just rattled off five or six that I feel we’re a little bit more specific and a little bit more accurate. Understanding the complexity of feelings, and so as an encouragement and as it related aside, I think that the more that you do this, the more you will find you are able to really hone in on the unique characteristics and emotions that the child is feeling. So in that moment the child comes home and says, “I have no friends, no one likes me”. We can maybe possibly identify that the child is feeling all of those things, but then I think we would probably say, “but you have lots of friends” or “I know that you’re friends with Johnny and billy and I don’t think that no one likes you. You’re a very friendly kid”. And so you can see how we then take that situation and we extended way beyond just validating what the child is feeling and that’s in our nature. You know, as parents, we want to protect our kids from pain. We want to help them feel better when they don’t feel well, especially if they’re struggling. We want to try to fix that for them and redeem the situation. And so it’s really difficult for us to re think that and retrain the way that we interact so that we can just say, “you feel really lonely when you’re at school”. And when I trained parents, they look at me with that expectant face, you know, as if, “OK, but then what are you saying?” And that’s such a struggle because we really want to jump in and fix something. And so one of the examples that I gave in the training was your child was waiting in line and another child cut in front of your child and your child said, “hey, it was my turn”. And then we were dialoguing how we would acknowledge what they were feeling and what we would say. And one of the moms that I was training said, well, I might reflect the feeling but that I would walk up to the other kid and I’d say, “you get back to the back of the line because there’s a line and you need to”. And I said, “well, that is, you’re trying to solve the problem”, but what do we say to your child who’s feeling frustrated, angry, betrayed, upset, sad, annoyed, you know, fill in the blank with that scenario. So it’s very, very common. You’re not alone in the struggle of wanting to fix things and wanting to change their mind or help them feel something differently. Another scenario I can think of would be if the child says, “I never get to do anything that I want to do”. In those types of conversations, it’s easy for us to say, “that’s not true. Just last week you got to choose where we went to dinner” or and those types of conversations and those types of redirections and and conversations that it in a different path. Rather than just saying “you feel sad that you don’t get to decide things more often”. It’s really helpful to just let that be enough because what that does is it communicates to your child what you feel is always acceptable. What you think, what you perceive, what you believe, what you are experiencing in this moment is always acceptable and it’s always valid. Not necessarily that you agree with it, but you can communicate through your feeling reflection that you understand what they’re feeling and help them to feel heard and help them to feel understood because that’s our role. The sadness is there. They’re just not using that word, so it’s our job as parents to say, “you seem sad about that”. “You wish that you could decide more things”. Notice how you’re not saying, I agree with you that you never get to decide anything. Notice that in the situation where the child says, I have no friends at school. You’re not validating that belief. You don’t have any friends at school, so we’re not necessarily in agreement, but we are always accepting of that feeling and that’s huge for a child because children need to feel that someone understands them. Someone hears them and someone can validate that their emotions and their feelings and their experiences are real. You know, I remember that phrase, perception is reality and kids perceive things differently than we do, and so to sit in that moment with them in those feelings and let that be enough, they learn that no matter what they’re feeling, you can understand it and accept it as their parent, so that is such a helpful skill. As you begin to reflect more, remind yourself that it is OK to say nothing more than that feeling and sit with them in that pocket. If it feels uncomfortable, it feels difficult. If it feels awkward, if everything in you is screaming, I just want to jump in and tell him something that will make them feel better or I want to fix this problem for him. Remind yourself that it’s not necessarily what you can offer as a solution in that moment that is far less important as offering your listening ear and you’re validating comment. “You’re really upset that that happened”. “You’re sad because your friend said something mean to you”. “That boy cut in line and you didn’t think that was fair.” Those are those moments where you’re helping the child understand I can always say anything to mom and dad and it’s OK what I’m feeling. They may not always agree. There are certainly not always going to fix the problem. They’re certainly not always going to redeem or change my mind about something, but no matter what I feel and think it’s OK to tell them because they’ll receive it and they’ll help me to process what I’m thinking and feeling. So I hope that encourages you to, if you’re not used to using the reflecting feeling skill, I hope that encouraged you to begin using that. I would love to hear emails and comments from you about how that goes and what happens as you start to say you the emotion and the explanation, and if you haven’t already, please go sign up for my newsletter, like me on facebook and subscribe to my youtube channel. That way you will constantly get weekly tips and skills and ways to be more confident in your parenting and ways to create healthy and happy relationships with your kids. So thanks for watching and I’ll see you again real soon.